Talking about giving is awkward. 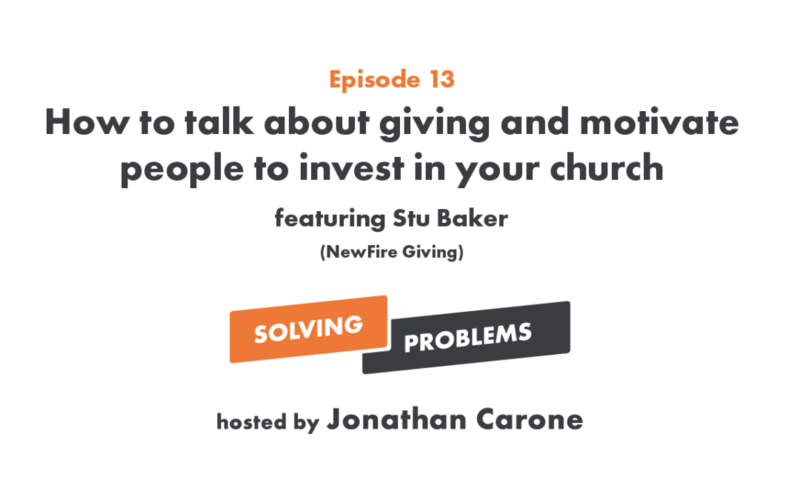 This week, we talk with Stu Baker from NewFire Giving about the biggest mistake churches make when talking about giving (2:49), why talking about money is weird (6:56), and how our biggest problem with the money conversation is our messaging (8:37). We also look at why giving to nonprofits is up while giving to the church is down (12:58), the #1 reason a person gives to an organization (13:55), and how Charity:Water used success to motivate people to give (16:50). To close the episode, we dive into how more options to give isn’t always better (19:39), when to use text giving (22:34), and the importance of celebrating giving (25:24). Featuring Jonathan Carone, Kyler Nixon, and Stu Baker.